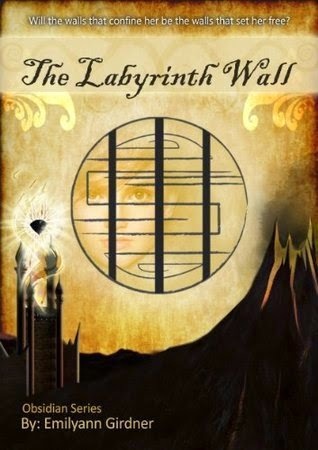 The Labyrinth Wall, by Emilyann Girdner, is a fast-paced dystopian fantasy. Girdner's first novel of the Obsidian series took off running and the action never stopped. Araina—a strong, independent young woman—is keeping to her loner routine within the dangerous walls of the labyrinth, when suddenly her sense of place and purpose is forever changed after witnessing a mysterious man emerge from one of the labyrinth's walls. The labyrinth is a dangerous, fantastical place full of unique creatures and gruesome death. Its inhabitants are all starved and must compete for resources. While I easily adapted to the setting, the rapid introduction of new characters disoriented me early on in my reading. I never did get a strong sense of Simul, the main villain. There was also some confusion about the age of the male characters, namely Darith and Korun. However, once I recognized that the characters were all roughly the same age, I was impressed with how Girdner managed to juggle such a large cast of characters, all the while keeping each voice unique. Araina and Blue's relationship was especially sweet and refreshing. I also liked how there are so many romantic coupling possibilities for Araina—will she eventually find love with Darith, Korun, Soll, or will she be perfectly content with platonic relationships with all of her new companions—something altogether new and rewarding for her. I look forward to the second installment in the Obsidian series and am eager to see Araina grow and flourish in her expanding worldview. Also, I heart labyrinths and mazes.